As many of you know Jeremy was The rhythm guitarist for The Run Around. What some of you may not know is that he was also a loving husband and father to two wonderful children. 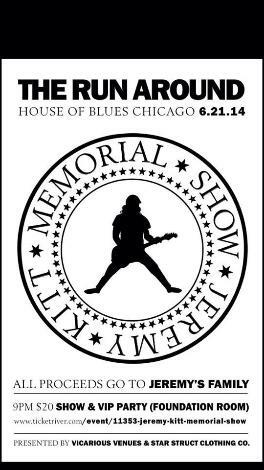 This show is to celebrate Jeremy's life and time in The Run Around and to also raise money for his family. Right after The Run Around's performance we will be hosting an after party in The Foundation Room of The House of Blues. The only way to gain access to that party is to buy tickets straight from here. In fact, the only way that The Proceeds from your ticket purchase go to The Kitt family is to get them directly from here. If you get them from The House of Blues site they don't get anything from it. So PLEASE, help them out and get your ticket here. We will also be having a 1 time only Run Around tshirt printed where the proceeds also go to The family.